It is difficult for outsiders to know whether Vietnamese cinema exists in Vietnam. In Hanoi, at least, there is little sign, if at all, of “movies,” apart from the numerous pirate DVD shops along the bustling streets of the tourist hub by Hoan Kiem lake, offering everything from the latest Hollywood blockbusters, each for about 3 dollars, to the Fassbinder classics box set. There seems to be no movie billboards or posters in the streets. Even in the pirate shops Vietnamese titles are few, less than a dozen, and most of them the obvious art house favorites such as “The Scent of Green Papaya,” “Cyclo,” and “The Vertical Ray of the Sun,” all of which are the works of Tran Anh Hung, the acclaimed French-Vietnamese filmmaker, and probably the only well known director with a Vietnamese name. Tran, despite growing up in France (where the current number of Vietnamese population is estimated to be over one million) and having lived there since the end of the Vietnam War in 1975, is without doubt Vietnam’s major bridge, evidently the only one so far, to world cinema, and it would be unfair to judge him as inauthentic based on his background. But it would also be a mistake to see Tran’s works as reflections of contemporary life in the post-war, increasingly consumeristic Vietnam. However, cinema has become such a powerful and influential contemporary artistic medium that it would seem unbelievable, even in a socialist nation, if at least a small group of local independent filmmakers did not exist at all. Hanoi Cinematheque, a “film club” tucked away in one corner of a charming complex that blends an appealing, semi-French Colonial boutique guesthouse (Hotel Des Artiste) harmoniously with the terra cotta tiled and ancient-tree shaded courtyard cafe (Cine Cafe) would come close to being the only social spot for Hanoi’s independent souls. The club, run by Gerald Herman, a film producer, former advertising executive, and longtime expat, is exceptionally active in organizing regular “film festivals.” A set of stairs by the cafe leads up to Vietnam Cinema Association’s Center for Assistance and Development of Movie Talents (TPD), a Ford Foundation-sponsored program that encourages and supports aspired Vietnamese filmmakers to produce short films. The entire complex seems to be the ultimate hidden oasis for cinema lovers. It is situated at the end of a long and narrow alley lined with long rows of parked motorcycles, making it an uncannily appropriate location to accommodate independent and liberal minds surviving in a socialist regime. Nguyen Trinh Thi, one of the few active “independent” Vietnamese filmmakers, and arguably among the most promising, seems at ease under the shades at Cine Cafe, only a couple of steps from the entrance of the Cinematheque, but her feelings towards the state of contemporary Vietnamese cinema is clearly less contented. “There is no such thing as independent filmmaking in Vietnam,” Nguyen, a petit, gracefully composed, yet seemingly indomitable woman in her mid thirties, remarks with certainty. “Maybe it’s starting now, but there are so many obstacles.” It is simply not possible for Vietnamese citizens to make films independently if the filmmakers want to eventually screen their films to the public. Every step of filmmaking, from screenplay to postproduction, has to be approved by the Ministry of Culture. 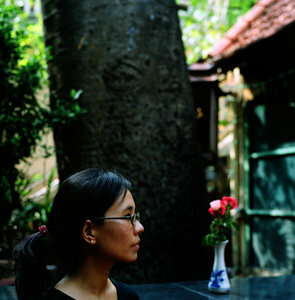 After completing her college education in Hanoi, Nguyen worked as a journalist for several publications and news organizations, then went on to study for two Master’s degrees in the United States. 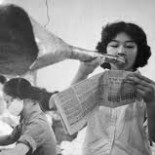 During her studies, Nguyen became interested in photography, but it was not until she saw documentaries by Rithy Panh, the veteran Cambodian filmmaker, that the thought of becoming a filmmaker occurred to her. “Love Man Love Woman,” Nguyen’s first feature-length documentary, released in 2007 and won Best Short Documentary Film Award at the Cambodian International Film Festival in the same year, is an engaging, controversial, and often enlightening portrayal of a popular folk religion in Vietnam called Dao Mau (Mother Goddess), a cultish tradition that has been around since the sixth century. Engaging because it follows one of the religion’s leading spirit medium named Master Luu Ngoc Duc, who is extremely charismatic and surprisingly outspoken about his unusual life. Controversial because the religion is clearly a community of gay men (referred to in Vietnam as “ai nam ai nu,” which literally means “love man love woman”) whose existence is otherwise either not acknowledged or condemned in Vietnam. Enlightening because it shows a part of true Vietnamese life that has scarcely been exposed to outsiders. Nguyen’s documentary, daring in its subject matter and impressive in its craftsmanship, considering that Nguyen is largely self-taught, is a fresh look at Vietnam through an insider’s eyes, yet it has all the elements that can attract the international audience: exoticism, humor, irony, and surprises (the Master at one point expresses his belief that homosexuality is a contagious disease). It is also a truly independent work because Nguyen did not submit it to be officially approved. Technically, “Love Man Love Woman” is an “underground” film in Vietnam. As her film suggests, evidence is always there if one cares to look for it. Independent filmmaking, despite what Nguyen Trinh Thi says, does exist in Vietnam, as long as Nguyen Trinh Thi is there.